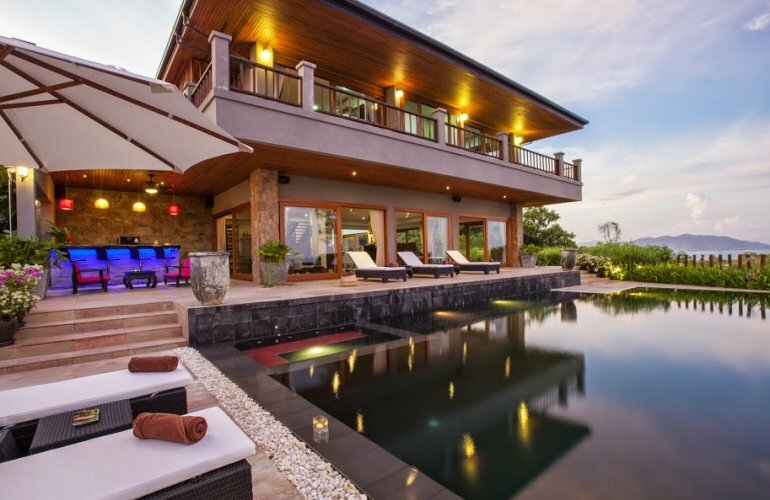 This beautiful four bedroom villa is located within an exclusive gated residential estate on the hillside above Choeng Mon beach, on the northeast coast of Koh Samui. With fabulous views over the ocean to the islands to the north and west, this recently completed villa offers a stunning setting for the ideal relaxed holiday with friends or family. It's under a 5 minute drive to the local beach, 10 to the airport, and the same to either Chaweng, the island's popular tourist resort, or Bophut's Fisherman's Village, with its eclectic mix of beachside cafes, restaurants and shops. Fresh and new, the villa oozes contemporary cool and clean design with the owner's personal Asian artefacts and colourful accessories. The cool tiled floor of the living room changes to warm teak wood for the landing, stairs and bedrooms. Downstairs an open plan living area with views of the pool and the sea beyond, features a TV area with satellite LCD/DVD, dining table and an adjacent fully fitted western kitchen. Full size glazed doors open up to the stone tiled pool terrace, a private black-tiled infinity edge pool, poolside sala and an outside bar with music system. The four double en suite bedrooms are located on the upper floor and accessed by a teakwood open staircase. Each of the four spacious bedroom suites are equipped with LCD TV and DVD. All bedrooms have teakwood flooring and open onto a spacious balcony with sun loungers and sea views.